Glendullan 15, color in the bottle is more accurate (the glass is taking some color from the gourd behind). This was a gift from a very considerate member of the family. It sure beats getting a tie! But of course, then the giver risks the chance I’ll critically review the gift. In this case, they can rest easy. 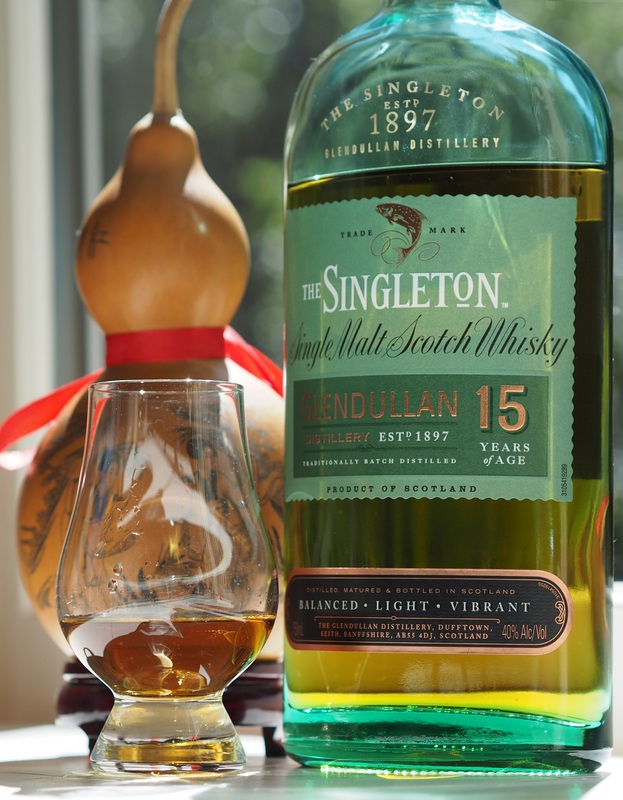 The Singleton 15, an American-only release, comes from Glendullan distillery in Dufftown. You won’t find much about the place online, though the folks at Malt Madness have a pretty good history of the place here. It’s a modern Diageo operation, producing 5M litres of spirit a year from six stills. I found it interesting that it has larchwood washbacks. Does it matter? Probably not; you can read more at ScotchWhisky.com. The Singleton 15 presents well for its price, and offers a very compelling value in a 15-year whisky, about $50 locally (Oregon). What you are hoping for in a 15-year is a noticeable step forward in maturation over a 10 or 12-year: a gentle nose, complex flavors, and depth as the flavor profile moves from taste to finish. In this case, the malt master has gone for a gentle and sweet dram, very approachable even for a non-Scotch-drinker. For the Scotch aficionado, this dram lies on the lighter side. I first encountered Clynelish 14 at the Whisky Library in Portland. I had taken a group of whisky-loving friends there for an end of year celebration. We tried a number of whiskies and the Clyne 14 caught my eye as at that time I had not had many highland malts. I found it quite pleasing, interesting on the palate and went to buy a bottle a few weeks later. The salesman directed me instead toward the Oban 14, and I went for the Oban. But I’ve been on the hunt for the Clynelish ever since and recently picked up a bottle. Time for a comparison—does it stack up against the Oban? 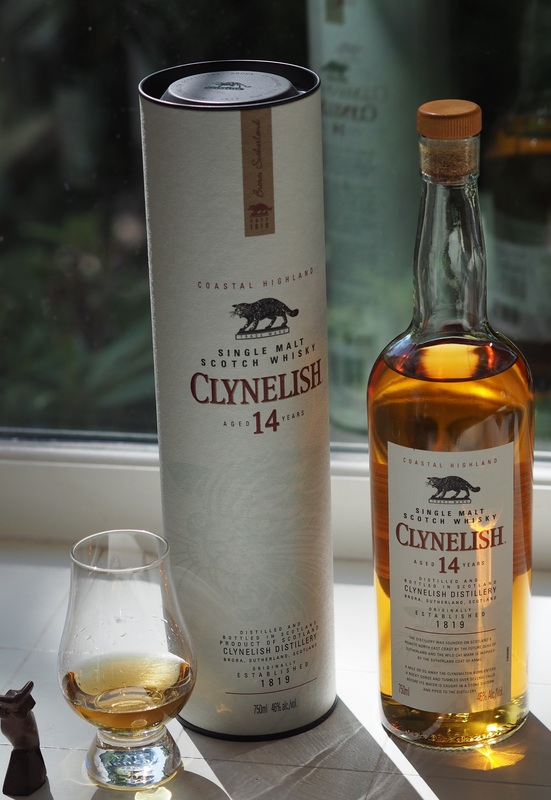 Clynelish 14, lovely straw color. The parallels between the two are interesting. Both are owned by Diageo, and presented in similarly classic packaging. 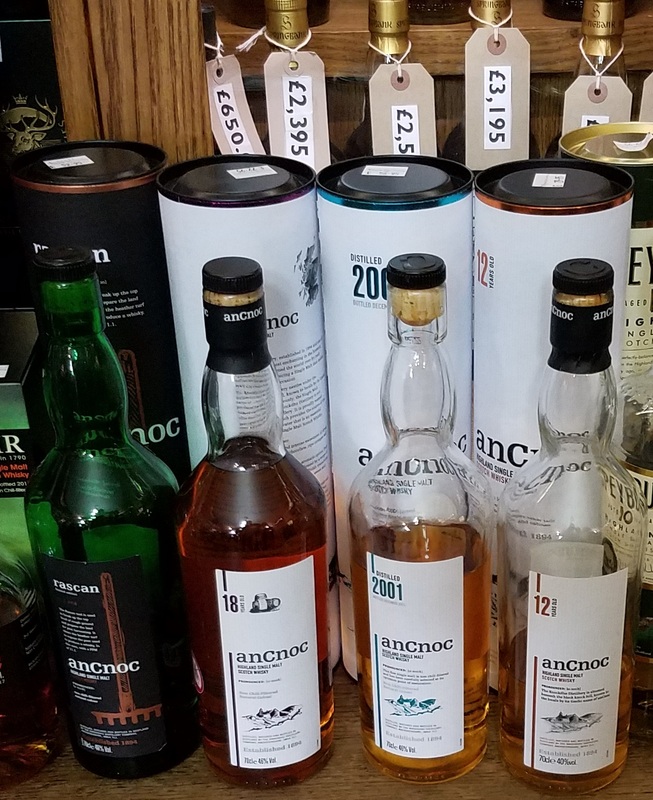 Both are coastal Highland distilleries (Oban west coast, while Clynelish is not far north of Glenmorangie on the east coast), both are 14-year expressions. There is quite a difference in output. About 4.8M litres produced yearly, the modern Clynelish facilities produce about seven times the output of Oban. (ScotchNoob has a great writeup on the history of the distillery). Both malts have a dry, nutty nose, with Clynelish being drier, and the wood shows more. Oban has a more complex nose loaded with more fruit and extends the palate considerably. The 46% ABV makes itself known with the Clynelish, as it can sting the nose, while the Oban 14 is, at 43%, completely gentle on the nose. I have to hand it to my local beverage store guy, he was right. Oban is like Clynelish, but more so. More so in price too, by about 45%. This being a dream come true, I hoped for a good experience. I had a great one. We were picked up after a restful night at our inn (the Bridgend, highly recommended) by Uncle Charlie, the proprietor’s ex-merchant marine uncle. A great guy was Charlie and full of information. He worried me a bit, explaining that Bunnahabhain was getting a bit frayed around the edges He was more animated by the prospect of a new distillery being built on the same one-track road where Bunnahabhain lies. And on arrival we saw a distillery that looked like distilleries did before they were tourist attractions: a working factory, with the dark grey coating the distilleries get from the odd collection of microbes that flourish around the Angel’s share. And out front, stacks of casks. Besides a crop, I have not retouched the photo. It was that grey and gloomy. Bunnahabhain, a working distillery. Click for hi-res. 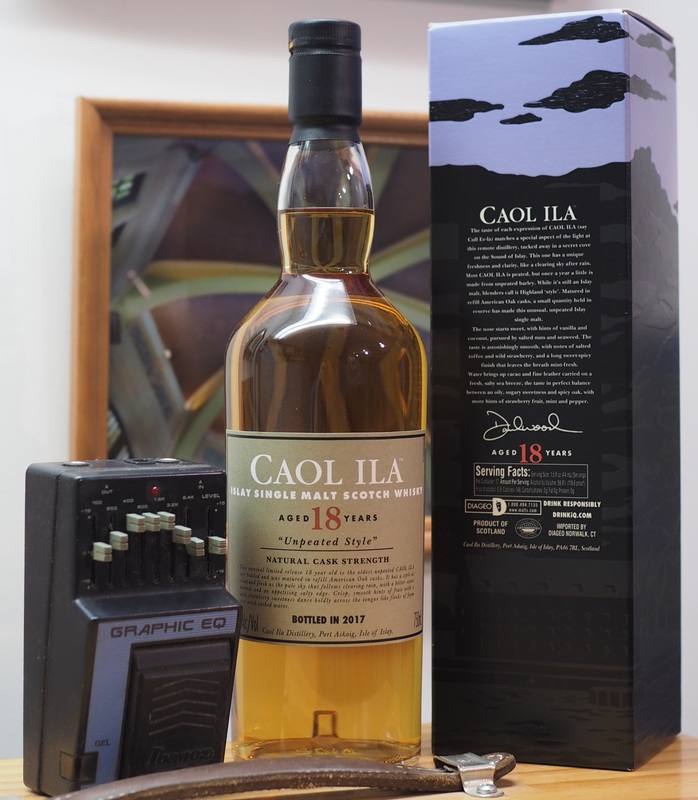 Caol Ila 18..what has it to do with an old stompbox? Just the colors…eerie! My wife and I each have a favorite island whisky, a whisky that has a twist. In both cases, the twist is a medicinal quality brought forward by the phenols imparted by the peat smoke used to dry the malt. The expressions and their unique flavors vary between distillers. For me, the peaty, weird island favorite is Talisker. For my wife, it is Caol Ila. We came upon Caol Ila off-handed: a neighbor brought a bottle of the 12 to a tasting at my house and said, “Someone gave me this, I don’t like it. You can have it.” I am not one to turn down a single malt. I thought the flavor a bit odd; it had a hint of nineteenth century mouthwash. But the wife lit right up. “I like this stuff,” she proclaimed, and grabbed the bottle. We’ve had it on hand since as a peaty alternative to the usual ‘nice’ drams like Glenmorangie, which she favors as a daily driver. I’ve even got used to it. This post will appeal best to those who read The Economist. If that’s not you, this entry will appear rather wonkish; you might want to skip to the bottom for the summary of tested expressions. NAS as a concept has taken the industry by storm in the last five years. This trend is driven by two factors: a restriction in supply of aged whisky used in traditional expressions and increased demand in the Far East (backstopped by continuing popularity in the West). And unlike other products, the supply of suitably aged whisky is restrained in an insurmountable way: there is no way to go back in time and put more whisky in barrels. The supply and demand interaction has two facets: if the distillers don’t react to higher demand with higher volume, the inevitable result is higher prices for their product and customer discontent; secondly, if the distillers fail to capture their share of the growing market, they risk losing market share to rivals. 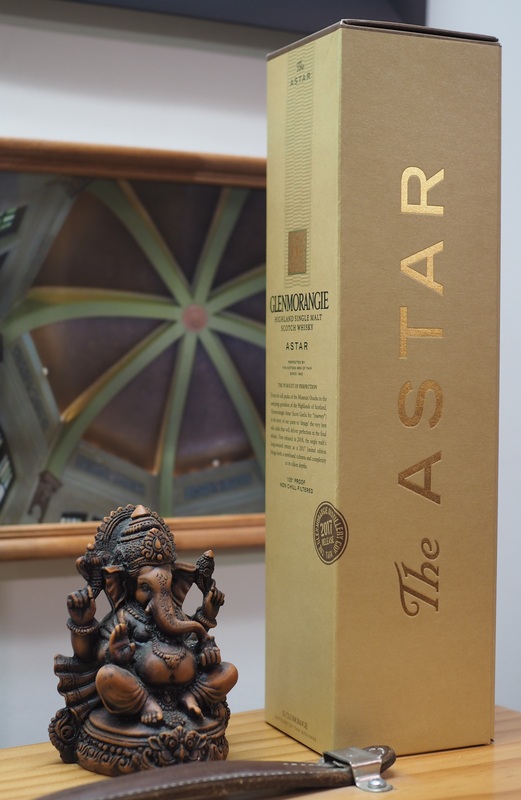 I thought ‘Astar’ sounded Far Eastern, so paired this one up with Ganesha. I have my wife to thank for the Astar. She had spotted an unpeated Caol Ila she wanted to try. We went to the local shop together and spotted Astar. We both like Glenmorangie’s offerings – they are reliably well done, balanced and focused. Their 10-year is a standard for us and what I serve guests who want to try a single malt for the first time. We have had tastings with the sherry, port and sauterne finished versions and they were well received. I also have a bottle of the ‘very rare’ 18-year old, which is some serious whisky. At $115 locally, it should be. The Astar is nearly as expensive at $99.95 and caught the good wife’s eye. If regular Glenmorangie was good, she reasoned, this expression, aged in barrels crafted with select woods, must be better. I was a bit more skeptical, noting the absence of an age statement. But given the malt master at Glenmorangie has produced so many good offerings, I relented and we decided to give it a go.